Ravensike Rigg is a shallow feature of the desolate moorland to the south of Lunedale, a tributary valley to that of the River Tees. The large snow streaked hill beyond is Mickle Fell. The foreground wetness is a slightly odd feature; it's not apparent in this image but it has been created by the purposeful blocking of a drainage groove by a tiny 'dam' seen just to the right of the standing water. 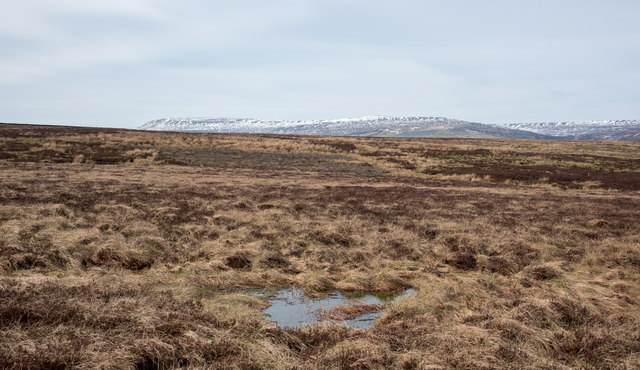 For some years there's been the policy of blocking 'grips', channels ploughed deeply into the peat of certain moorland areas to promote drainage. The aim in the blocking of those grips is to re-water the land. The unusual thing here and in other places in the vicinity is that the water channel is not a grip, but a minor, natural watercourse. Perhaps it was blocked in error.